How was your weekend? Was it busy busy or nice and low key? It was all low key in my neck of the woods and I wouldn't have it any other way. Low key = a chance to recharge. I'm excited about my upcoming week...mostly because the hubs and I are going to see John Mayer and Phillip Phillips in concert tomorrow! Woo hoo! Has anyone had a chance to see one of their shows since the tour began? I still plan on posting an outfit photo this Wednesday even though it'll be a late night because of the concert...I'll make it work! Lightest Blue is the most delicate and divine blue I've ever had on my paws. There is a faint gray tone to it that keeps it from being JUST blue...really gives it a lot of depth. 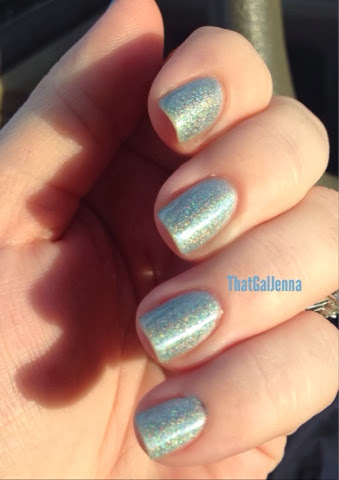 The holo is perfection in this color...it shines like a faint and lovely rainbow depending on the lighting. #06 you are my #1 true blue love! A pretty pair of macros because I couldn't decide which one I liked better...you can see the subtle rainbow a little differently in each. Oh look! 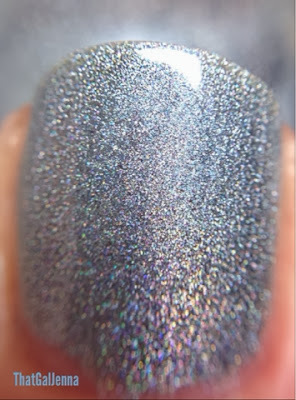 Another pair of macros I couldn't choose between because they both show different facets of the polish. It looks almost unbelievably shiny and shimmery but I promise...it's like this but even more so in person! 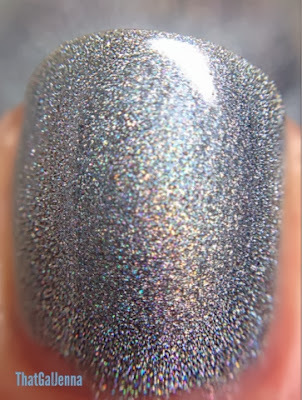 This was 3 coats but 2 coats would be sufficient...even with 3 it did not feel thick. So intense and so incredibly stunning. This one will get your paws noticed! Word on the street is Aly may be opening the shop up at some point in December but I'm sure more accurate info will be given throughout the month on the Aly's Facebook Page. Needless to say...I'll be placing yet another order whenever the shop opens again!